Bedford Queens kicked off their Midlands Four East South campaign with an excellent 42-3 victory at home to Old Newtonians on Saturday. The hosts were without coach and fly half Ashley Tapper alongside John Filsell, Neil Mills, Dave Morrish, Dave Hull, Tom Clarke, Steve Hoath, Andrew Jackson and Henry Williams, as they opted to keep things simple, stick to the basics and play to their strengths. 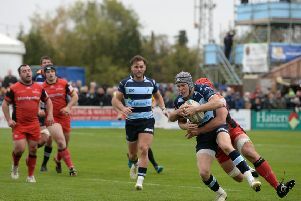 This tactic paid off almost immediately with stand-in fly half Lewis Perrin, who was impressive throughout, playing a neat inside ball to rampaging winger Ryan Lennon. The newly appointed captain burst through a gap in the Old Newts defence to crash over the line, with Chris Bell converting. Queens continued in the same vein for the next 20 minutes adding two more scores from Alistair Wilkinson and Alex Wright. After this Old Newts had their own purple patch and began to press Queens back in their own half, kicking a penalty to make their way on to the scoreboard. Following the half time interval Queens got back to business and were able to secure the five points as Adam Tysoe crashed over minutes after coming on the field. Moments later Tysoe found himself in the wide channel and a quick set of hands saw him touch over in the corner and then he was promptly taken off after having quite an impact with two tries in just 20 minutes. One of the best scores of the afternoon saw Alistair Wilkinson tackle Old Newt’s last man and with no offside line, intelligently won the turnover quickly, facing the wrong way, yards from the line and turned for an easy touch down. Queens threatened to add some more points, but that turned out to be the last score as they host Wellingborough OG’s this weekend. Queens: S Yates, A Wright, J Fisk, W George, W Simpson, R Dunn, S Caddick, B Simpson, D Stapleton, L Perrin, C Bell, J Wells, S Morris, R Lennon (C), A Wilkinson. Subs: D Starling, S Fleming, J Bliss, A Tysoe, T Clarke.